Hello. The election season has just started! If you have a look at the numbers, you would wonder how much does it take to held such, in the world’s largest democracy. Please ensure you don’t forget to vote or rather don’t be lazy to go out on the election day to exercise your vote. Arey yaar, mein bhool gaya! How many times have you heard this before? Or maybe said this yourself! 🙂 There are so many things that we remember (like secret passwords) and many that we forget. Often. Frequently. Wonder why? Is it because of less interest to remember such or something else? While there is quote that says, ‘It’s hard to forget someone who gave you so much to remember’ there is also this, ‘Sometimes we survive by forgetting’. We aren’t talking only about such ‘forget’, but about things that you aren’t able to recall regularly. 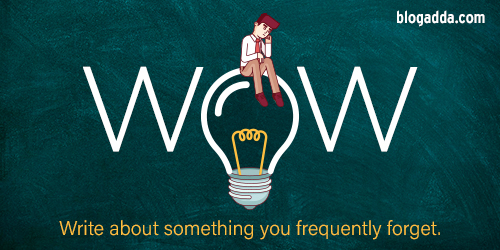 This weekend, for the WOW prompt, we would want you to ‘Write About Something You Frequently Forget‘. Share with us the funny moments when such happens or maybe serious disasters! How do you manage what happens next? Do you work with lists and other reminder tools? Tell us all. Do ensure you write and publish your blogpost before Sunday midnight and share with us using the link below. Ensuring a valid entry gives you a chance to win the WOW badge that you can flaunt on your blog and social networks. Nice blog post..i like it. Mein bhool gaya is a very famous phrase in our life . M a full time mom of pretty doll who always keep me busy through out the day and most of the time I forgot to do many small things . Like adding salt in veggies at dinner table when my hubby says there is no salt in dal my expression was oopss mein bhool gayi this thing happens woth many a times once I went for shoppinh in hyper market and luckily there was a huge a discount oh I started shopping and told my hubby to take care of baby and we both forget about our baby she was sitting on the shopping cart and we both said harshika ko tu hum bhool hi gaye 😜. Why Do I Frequently Forget? A short poem for you! Like me, do you forget too? Next PostNext WOW: Experienced Something That Could Not Be Logically Explained?